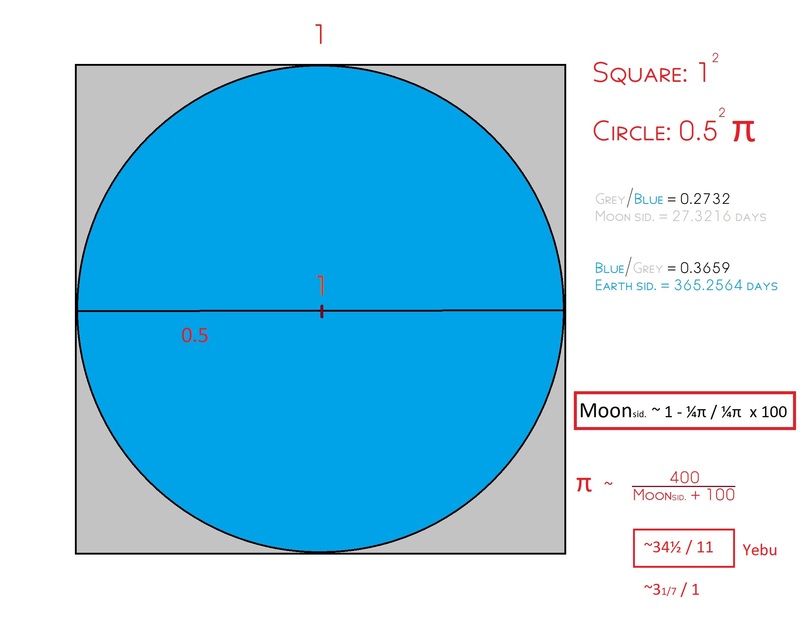 You are correct, the Moon is "hiding" in π (π is hiding in the Moon), though you make it too hard for yourself. ...and so all you need is to track the Moon for a month across the map of the stars and that gives you one sidereal period to within ½ day, i.e 27½ days. If you track the period for several cycles and average, you'll approach the true period, 27.3216 days. This was definitely within reach of Old Kingdom astronomers. In fact, the "Kenmut" decan (Leo and Hydra) is mentioned in the Pyramid Texts, but any asterism near the ecliptic (which the Egyptians also mention in the PT) would do. But the ancients did not have the formula and neither did they likely care to search for pi. They did, however, care about the Moon/Thoth and his "ferrying" above and below the ecliptic (see Parker; see Krauss). So pi can only be an import incidental to something of theological significance...but how could the constant have been imported, even if unwittingly? What I show at the bottom is the expression for π in days of the Moon. If you convert to seconds, the fraction simplifies to ~34½/11 and ~3 1/7 to 1. And, it is this numerical relationship, 34½/11 and 70/22, which shows up in the reconstructed step dimensions of a couple of the Small Step Pyramids, especially the only one confirmed to be in close proximity to a temple proven to be oriented to the star Sirius (Wells) and dedicated to Satet, the goddess associated with that star in the south of Egypt from at least the Third Dynasty. So the astronomical gateway would have been Sirius, but why and how? The reason is that the Nile flooded the south before the north and the delay could be significant. Predicting when the fields would flood was of utmost importance to the Delta. Lower Egypt's entire economic infra-structure depended on not just if, but also when the flood would come. Since the appearance of Sirius after visual absence was a yearly marker of inundation, this became the temporal anchor. The absence period in Memphis tended to be about 68-71 days and at Aswan (Gautschy), about 11 days shorter, 57-60. That difference of 11 days was a key observation because it correlated with the delay of the inundation. And that is why the numerical dimensions of the Small Step Pyramid on Elephantine are possibly significant. In cubits, they represent both periods in days, 69 (+/- 1), and 58 (+/- 1) and the difference, 11.